Wedding Venues in Raleigh, N.C.
With Southern charm and beautiful weather, it&apos;s no wonder that couples are choosing Raleigh, N.C., as the backdrop for their special day. Historic buildings and vintage architecture offer a different venue for a wedding that will be uniquely Raleigh. If you’re looking for the spot for your big day, check out this list of beautiful venues, and even more listings (plus detailed search functions) below! 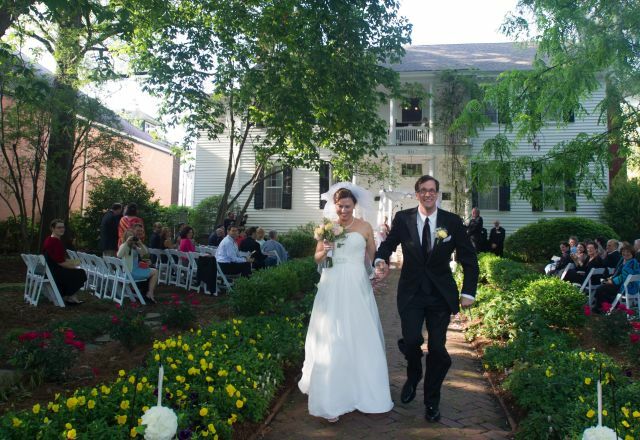 A winner of WeddingWire&apos;s Couples&apos; Choice Awards®, Haywood Hall is one of the oldest homes in Raleigh. Built in 1792, this venue features classic, Southern architectural staples and has one of the best outdoor wedding settings around. The downtown Raleigh Merrimon-Wynne House was built in 1876 and has since been restored to its original grandeur. The expansive grounds are meticulously groomed, and the home features white walls, original fireplaces and plenty of natural light for photos. With natural beauty and a classic Southern look, Highgrove offers ideal settings for both indoor and outdoor ceremonies. Located in Fuquay-Varina, this venue spans seven acres and features a great view of Lake Laurel. Home to Cary’s championship golf course, Prestonwood Country Club boasts an immaculately-maintained rolling, green course—a picturesque setting for an outdoor wedding. If you&apos;re looking to keep things indoors, the ballroom is the way to go. Located on the 28th and 29th floors of the Wells Fargo Building in downtown Raleigh, City Club Raleigh offers panoramic views of the skyline and surrounding areas. The club has seven function spaces that can accommodate groups up to 350. Market Hall is a historic multi-use space located in the center of City Market in downtown Raleigh&apos;s Moore Square district. The beautiful building celebrated its centennial in Oct. 2014, and its natural brick walls and high ceilings provide a blank canvas for brides and grooms to create a look all their own. The Stockroom is located on Raleigh&apos;s bustling Fayetteville St. downtown with more than 3,800 square feet of open event space, 13-foot ceilings and stunning views. The metropolitan ambiance is created by floor-to-ceiling exposed-brick walls, restored hardwood floors and architectural trusses. Located in Midtown Raleigh at Crabtree Valley, The Glenwood has spacious rooms that can seat up to 200 guests dining and 400 guests cocktail-mingling, with additional lounges, dining rooms, a games room and a beautiful, outdoor amphitheater in the wooded area behind the venue.